This design for 44 units of housing that generates more energy than it uses was a finalist in a 2013 development competition for Mission Hill in Boston, MA. It is urban infill on a larger scale: filling in a multi-lot site that has a residential neighborhood up the hill and a commercial one down on the busy street that follows the river. The proposed central walkway highlights the connection and transition from the upper, more residential Parker St. to the lower, more commercial Terrace St. The change is elevation is significant: 37’. The central walkway and the community garden are the foundations of this verdant site plan. The project’s built environment is meant to mirror and blend the two existing building typologies of the site. All of the buildings are required to provide enough combined roof area to handle the multitude of solar electric (85%) and solar thermal (15%) panels required to generate enough energy for the occupants. A water storage tank built into the hillside stores the energy from the solar thermal panels to pre-heat the domestic hot water for the on-demand hot water heaters. Electric air source heat pumps supply the heating and cooling. The building envelopes are state-of-the-art with regard to energy efficiency and moisture control, yet utilize a “low tech” approach and are no more costly to construct than a typical multi-family development. 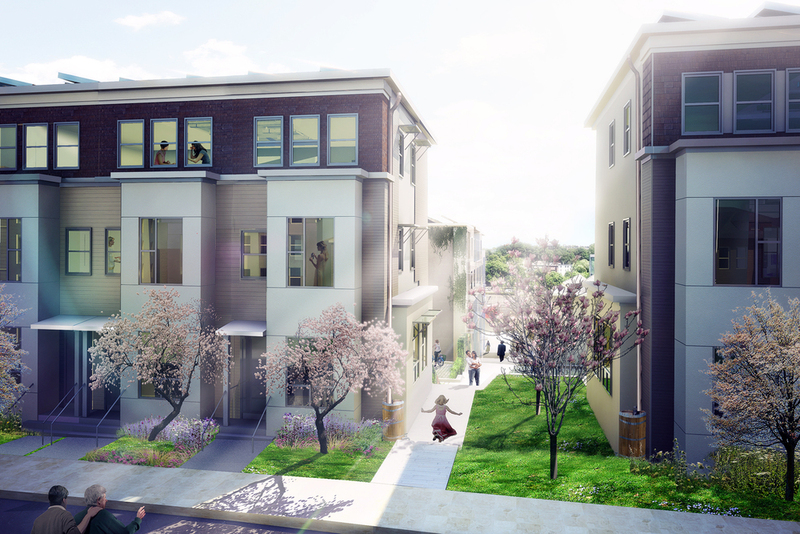 All in all, this project captures our latest thinking on larger net-zero multi-family housing.